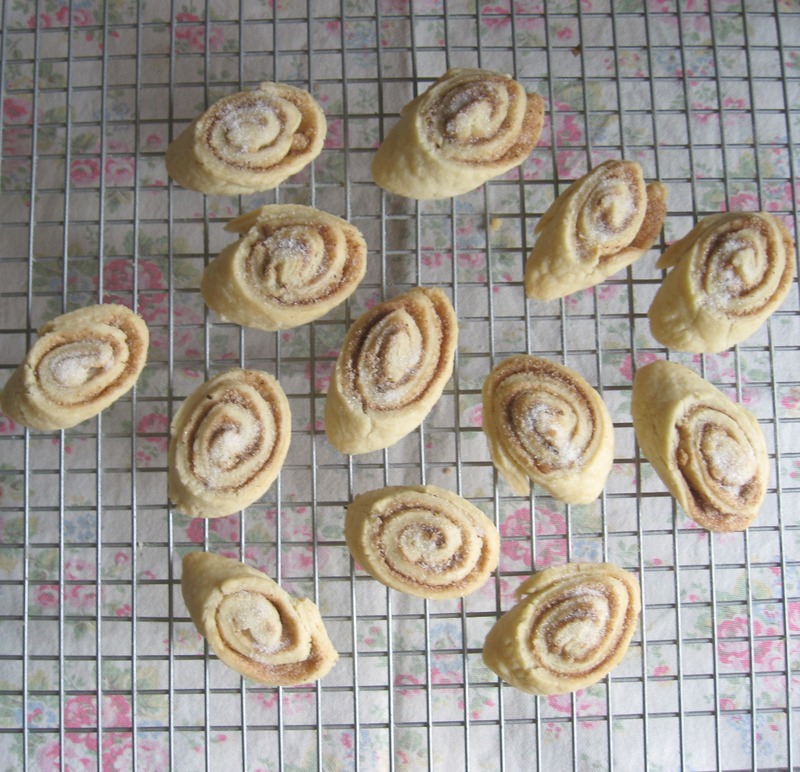 Ridiculously easy and quick but very nice to eat Cinnamon biscuits…. Generally at least once a week I find myself making pastry for a pie, sometimes savory, sometimes to cover apples or fruit. Inevitably I always make a bit too much and rather than put it in the compost (it’s a Japanese one with bran so won’t encourage mice) I tend to make a little batch of these cinnamon biscuits….they are so ridiculously easy to make and bake on a tray on the shelf below the pie….. In a decent sized clean jam jar, fill about halfway with soft brown sugar. Then add some caster sugar (golden or white, it doesn’t matter), I use about half the amount of the brown sugar. Then add a couple of tablespoons of cinnamon. Put the lid on and give it a good shake up and down so the ingredients are properly mixed. light olive oil, or melted butter if you have the time to melt some. Roll out your dough, I find rolling pastry out between two pieces of clingfilm stops me having to add too much flour to the dough, the pastry can be rolled out pretty thinly. Try to keep the pastry squares, if it gets a bit odd shaped, remove the top piece of clingfilm, cut the pastry and lay the pieces over each other then clingfilm over and roll out so it’s sort of oblongy ….it doesn’t have to be exact….remove the top piece of clingfilm, lay it down and sprinkle with a little flour, turn the pastry over and peel off the second piece of clingfilm. Brush over some light olive oil (or if you have time, melt a little butter…it doesn’t make a big difference in taste to be honest) and then sprinkle over a generous layer of the cinnamon sugar. Briefly flatten it down and evenly spread it. Fold up the pastry along the edge closest to you (it will roll up off the floured clingfilm pretty easily.) Dab a little olive oil along the top and roll a bit more so it becomes like a swiss roll. Add oil accordingly. When you get to the end, tuck the bottom underneath. With a sharp knife, cut the pastry into slices on the diagonal. Place on a baking parchment lined tray and bake in the oven, I find gas 6 for about 20 minutes is good on the second shelf but it depends on what you are baking already. Check after 20 minutes. Remove from the oven, and sprinkle with a little caster sugar. I think reading the instructions takes longer than making them……these are so super quick and my boyfriend can wolf down half a dozen in the blink of an eye. I use half butter and half t-rex when I make pastry, if I have them I also add a beaten egg (saving a little back to coat the pie top) but if not I just use chilled water from the fridge. *thank you Raymond Blanc for that tip.